The Kestrel 4400 Heat Stress Monitor was selected by the Singapore Government for its wide spectrum of features; outstanding durability and excellent technical support. Such a large contract shows great respect for Kestrel's capabilities and reputation. For the human body, there are few environments more debilitating and damaging than extreme heat conditions. Military units that conduct troop training and operations in hot climates must take particular care to monitor and adjust for heat stress conditions to prevent soldier injury and death. With heat indices on the rise worldwide, government defense departments are considering accurate heat stress measurement mission-critical. WBGT – Wet Bulb Globe Temperature – is an aggregate environmental measurement that combines the heat stress factors of ambient temperature, humidity, sunlight, radiant heat, and wind into a single number that provides accurate guidance for safe hot weather activity. 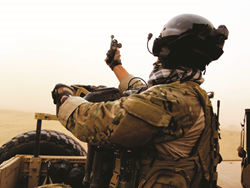 Recently, the Government of the Republic of Singapore issued a contract request for a military-grade WBGT monitoring device to help protect their troops in hot environments. Lee Hung Scientific Ltd., Singapore’s premier provider of scientific instrumentation, responded with their recommendation for an accurate, reliable, portable and rugged WBGT meter: the Kestrel® 4400 Heat Stress Tracker. "The Kestrel 4400 heat stress monitor was selected by the Singapore Government for its wide spectrum of features; outstanding durability and excellent technical support. Such a large contract shows great respect for Kestrel's capabilities and reputation." The Kestrel 4400 Heat Stress Tracker gives accurate, waterless WBGT readings as well as TWL (thermal work limit) measurements within minutes of exposure to the air. The Kestrel 4400 also provides on-screen alarms when conditions enter user-settable danger zones, providing immediate guidance that can prevent heat illness and injury. The Kestrel 4400 is fully waterproof, pocket-sized and tripod mountable. The Kestrel 4400 is also a full environmental weather meter, offering readings of all meteorological measurements commonly relied upon in military operations, and can be Bluetooth® enabled. Sealed to IP-67 standards and drop tested to MIL-STD-810G, the Kestrel 4400 is built to stand up to real-world operational conditions. The Kestrel 4400 is designed, developed, built, tested and supported by Nielsen-Kellerman in the USA. NK is proud to be both a recognized leader in Lean manufacturing and process improvement and an award-winning top workplace.